“The directions on the back of the Chebe cinnamon rolls package are easy to follow. I add an extra tablespoon of butter to my dough, and two more tablespoons of milk. I do this to make the dough softer, and I refrigerate the dough for 30 minutes to help it absorb the additional moisture. 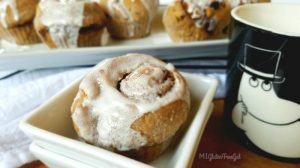 You will need to use extra rice flour when rolling the dough for these Chebe cinnamon rolls. (If you’re grain-free, you will need to find a different flour with which to dust your surface.) 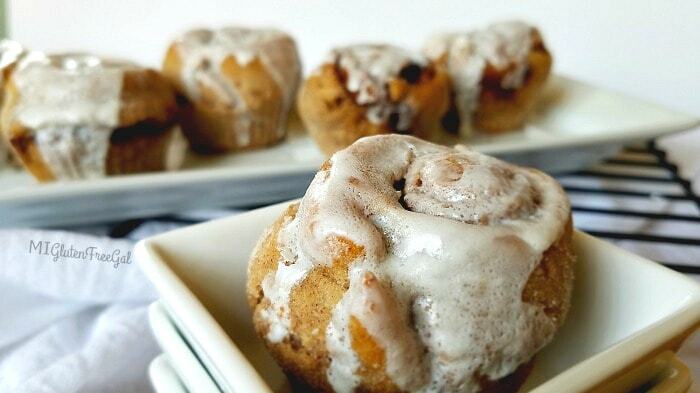 After you roll out the dough, you brush it with melted butter, and then top with a cinnamon and brown sugar mixture. 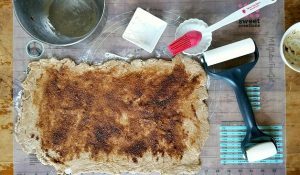 It is suggested to roll the dough for these Chebe cinnamon rolls into a 12 x 18 rectangle. This is so you can have eighteen equal portions. However, I’m a rule breaker and cut mine into 9 equal portions. I then placed them into the blue silicone liners I received in my American Gluten Free box and smushed them down a bit to widen the dough balls. 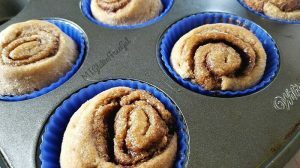 Sometimes Chebe products can dry out, so I baked my cinnamon rolls at 350 degrees instead of the 375. (I’d also suggest dabbing them with a dab of butter prior to baking, to help retain moisture.) I also baked them for 18 minutes.